PoliceAuctions.com, home of police auctions and government auctions on the web, will be using social media giant Facebook to auction a fossilized Mosasaur tooth. The one-dollar no reserve auction will end on Monday January 21st. Mosasaurs were predators that preyed on sharks. PoliceAuctions.com, home of police auctions and government auctions on the web, is auctioning a fossilized mosasaur tooth. The auction closes on Monday January 21st. In the late Cretaceous Era massive fifty-foot long aquatic reptiles hunted the coastal shallows of the world. Known as mosasaurs these huge reptiles were the dominant aquatic predators of the day. Equipped with a double-hinged jaw designed to swallow prey whole mosasaurs were predators that preyed on sharks. Although they were air-breathing reptiles mosasuars were so adapted to life in the ocean they birthed their young live in the open water. PoliceAuctions.com, home of police auctions and government auctions on the web, is auctioning a fossilized mosasaur tooth. The auction closes on Monday January 21st. The mosasuar tooth being auctioned by PoliceAuctions.com has been naturally fossilized. The fossilization process occurs when organisms buried underground are filled with mineral rich ground water. The minerals from the ground water then precipitate into the empty spaces of the organism. 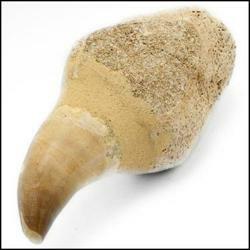 PoliceAuctions.com will be using their Facebook fan page to promote the auction for the fossilized mosasuar tooth. PoliceAuctions.com fans will be able to view photos for the fossil and link back to PoliceAuctions.com to bid. The mosasuar fossil auction will be a one dollar no reserve auction. This means that if the auction for the fossil ends at only one dollar than the lucky winner would only pay one dollar, plus shipping and any applicable taxes, for the artifact.